The story of Gerston whisky is a tale of two distilleries, known as Gerston One and Gerston Two. Gerston One was a family-owned farm- house scale distillery, with a typically small output, making high quality spirit that was in demand both at home and further afield. It was enjoyed by the great and good of London society and had customers as far apart as Brazil and India. It existed for over eighty years, and remained in the Swanson family for nearly all of that time. Gerston Two was an industrial scale distillery with a capacity of 80,000 gallons of spirit per year. The owners hoped to emulate the success of the whisky from Gerston One by building a new distillery, which had a capacity almost ten times the size of Gerston One. When it was opened in 1886 it was arguably the most innovative and modern distillery in Scotland, and certainly the largest distillery in Caithness. Its design utilised a natural fall in the land, which allowed gravity to govern the process and the movement of liquids. Production at Gerston Two lasted for little over two decades – they were unable to replicate the success and, importantly, quality of spirit previously associated with the Gerston name. 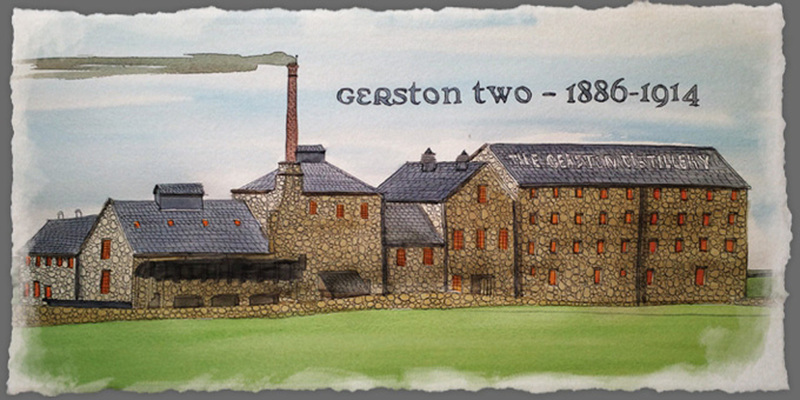 Gerston ‘Two’ Distillery – an artists’ impression. By Adrian B McMurchie. The Gerston distilleries were located in Halkirk in Caithness – a remote area in the far north of Scotland. The economy in this part of Scotland is primarily farming and fishing based, although large parts of the region are comprised of rocks and bog, and unsuitable for cultivating or tending animals. It was, however, ideal territory for hiding and operating unlicensed stills. Excise returns for 1826 show at least 17 licensed distilleries in the area, with the Caithness Courier reporting over 200 convictions for unlicensed distillation in the county that year! Gerston One was founded by Francis Swanson in 1796. Swanson ran the distillery until 1825 before handing the business to his son James, who remained the owner until the distillery was sold in 1872. The distillery was closed in 1875 and demolished in 1882. Gerston Two was built in 1886, approximately a mile from the site of Gerston One and close to the newly opened train station at Halkirk. The owners of Gerston Two were a London-based consortium – The Gerston Distillery Company. Production lasted only 11 years before it was sold to Northern Distilleries Limited, who changed the distillery name to Ben Morven. Distilling at the re-named Ben Morven continued for only another three years before ceasing in 1900. There is evidence of sporadic production thereafter, until the site was officially declared closed in 1911 and demolition commenced around 1914. The water source for Gerston One was an unnamed stream next to Gerston farm. The water ran from a nearby well before emptying into the Calder Burn. Maps from the era show the well, and the collection pool, thus indicating that Gerston One had concerns over water supply. Local water is exceptionally pure, with unusually high salinity. This would add a salty edge to the spirit, neatly accompanying the strong peat reek of Gerston One whisky. When Alfred Barnard visited Gerston Two in 1887 he was informed that they had exclusive rights to the same water source. However due to the distance between the two sites, we believe this is highly improbable. Gerston Two most likely used the nearby Calder Burn, which is a tributary of the Thurso River. A separate channel was built outside the distillery, which allowed water to flow through the complex for cooling and mashing. Cooling water was later returned to the burn beyond the distillery. Gerston One used local peat from nearby Loch Calder. Peats cut in this area are distinctly briny and salty. Although it is several miles from the coast, geological evidence suggests retreating glaciers from the last ice age deposited large quantities of beach debris in the area, thus adding to the medicinal composition of the peat. There is no evidence that Gerston Two used peat at all. When Alfred Barnard visited in 1887, he noted that the spirit was “pure malt” a term, at that time, used to describe non-peated whisky. The barley strain grown at Gerston farm was Concerto, a high-yielding variety favoured by farms in the area around Thurso, and is still grown by the present farm owner James Gunn. From the distillery cashbook there is evidence of Bere barley being purchased in 1858 from farms in nearby Harpsdale and Skinnet. Barley malted at Gerston One was key to the success of the whisky. Evidence of this can be found from the 1826 Excise returns for Caithness, which noted that Gerston One produced 5763 proof gallons from 2891 bushels of barley. Using modern units of measure this equates to 30695 litres of alcohol from 63 metric tons of barley, giving a yield of 487 litres per ton of barley. The yield at Gerston One was the highest of all Caithness distilleries at the time. Gerston Two shipped barley from the Lowlands of Scotland, and occasionally brought in barley from Eastern Europe. They had malting floors covering 9000 square feet and were floored with Portland concrete. Barnard noted the use of conveyors, and the saving of labour in this part of the process. The barley used at Gerston Two could not attain the high yields attained by Swanson’s barley, and subsequently the whisky was judged accordingly. Gerston One would have favoured a combination of wild yeasts and domestic cultures. Wild yeasts are largely air-born, and the domestic culture was derived from potatoes and sugar. Gerston Two shipped commercial yeast supplied by Cameronbridge Distillery. Gerston One would have most likely used a puncheon or similar-sized vessel for mashing. As the process was installed inside pre-existing farm buildings, they were always constrained by height and space. Gerston Two had a set of four concrete mash tuns. Malted and kilned barley was elevated via a conveyor belt and dropped straight into the concrete tun. The draff house was located directly beneath the mash tun, and draff was collected via a sluice port. Gravity was also used to move mash from the tuns via an under-back to the wash-backs. In this process, a Morton’s refrigerator was used to cool the liquid to a temperature that allowed yeast to be safely added. This was another example of Gerston Two’s modern design that marked it out as the most innovative of its kind in Scotland when built in 1886. Gerston One used a wooden washback – again likely to be a puncheon in the earlier years then most probably a purpose-built vessel as the business expanded. Gerston Two had six wash- backs made of Quebec red pine. They had a capacity of 8000 gallons each and were designed so they could be steam-cleaned after use. Some workers outside Gerston ‘Two’ Distillery which, at that point, had just been renamed ‘Ben Morven’. By Adrian B McMurchie. Gerston One did age its spirit and would have used casks that were shipped or emptied at the dockside of Thurso (Scrabster) or Wick. The strong tradition of rum consumption in the north and east of Scotland suggests that ex-rum barrels may have been used. They also shipped spirit in earthenware “quarts”. The Whisky was largely sold in the local area. The cashbook for Gerston One from 1849 shows they had over one hundred customers in the Caithness area alone. Whisky was supplied in cask to merchants, private individuals and to local landowners, including Lord Thurso of Thurso Castle. It was most likely the aforementioned Thurso who introduced Gerston Whisky to prominent politicians of the day – including Sir Robert Peel, who was Prime Minister from 1841 to 1846. Other notable consumers of Gerston were the Duke of Wellington, the Bank of England, the Army and Navy Club in London and the Archbishop of York. The cash book also lists customers in Buenos Aries, Calcutta and Madras. By 1898 Gerston Two (now renamed Ben Morven) was using sherry buts and hogsheads. The choice of cask was more in line with the ambition of the distillery to supply the lucrative London market with whisky – the softer lush tones of ex-sherry casks, along with un-peated spirit being more to the taste of southern palates. Gerston One existed for 86 years and distilled for nearly all of that time. It enjoyed a high reputation both in Caithness, and in London where it was the drink of choice amongst Lords and Prime Ministers. The undoubted quality of Gerston One stemmed from effective use and control of local raw materials. The water from Swanson’s well was sparklingly clear, and most of the barley grown by Swanson himself. Both Francis Swanson and his son James were masters of the distiller’s craft, and their ability to generate such high yields is substantive evidence of this. However, in 1871 Swanson placed the distillery up for sale via an advert in the Caithness Courier. Anecdotal evidence suggests that a neighbouring farmer dredged land adjacent to the well, resulting in it drying up. A letter of 1975, sent to the People’s Journal in Dundee claimed that the local water supply was ruined when a planned extension to the distillery cut the flow of the spring, causing it to flow in another direction. Either scenario would have been ruinous for the distillery. At the age of 76, Swanson quite possibly concluded that the business was no longer viable. The distillery was sold but never produced the same quality whisky again, and closed for good in 1875. Gerston Two was built on an entirely different scale and was by far the largest industrial complex in the area. When built it was the most technically advanced distillery in Scotland. The Gerston Distillery Company set out to develop the existing demand for whisky from Gerston One – particularly in London. However they chose industrial solutions to supply raw materials, fundamentally changing the taste of Gerston whisky, and as a result found it difficult to replicate the taste or quality of Swanson’s whisky. While the water source was of good quality, the Lowland barley shipped north did not match the yield of Swanson’s concerto & bere barley. Gerston Two elected not to use peat for kilning barley or for firing the stills, they shipped in coal from the mine located at Brora just down the coast. The much larger stills at Gerston Two produced an entirely different type of spirit – softer and lighter when compared with Swanson’s whisky. The decision not to use local raw materials had consequences for the distillery. Local people bristled against a London based business that was not seen to be supporting the community. 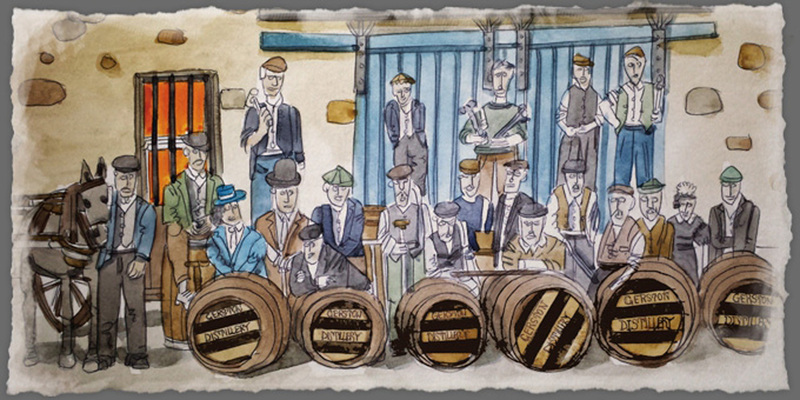 Merchants who previously bought Gerston One spirit largely shifted their trade to neighbouring distilleries such as Old Pulteney, who continued to provide the “peat reek” whisky of Highland tastes. Barnard commented at length in an article of February 1887 to the Caithness Courier, on the efficiency of the new distillery. While this modern distillery pointed to the future of distilling, it became clear that far fewer workers were required than had been originally assumed. While the work force numbered at least twenty in 1898, only three men were required for coaling the one centrally installed furnace, and presumably none at all for cutting peats. If the story concerning the water supply for Gerston One is accurate, then we can say that the distillery simply ran its course, and its rise and fall ran parallel to the vigour of both Francis and James Swanson. Gerston Two made a series of strategic decisions which meant that they could never capture the potential created by Swanson. Disappointment felt by local workers and merchants was largely aimed at London businessmen and while not central to its failure, was certainly a contributory factor. They did not grasp the concept that the whisky from small stills cannot be replicated via a large scale industrial process. While they attempted to copy the spirit profile of Gerston One, it never occurred to them to use the same raw materials, particularly local barley, and Loch Calder peat. Lastly, they attempted to enter the market in London rather later than other established whisky brands. The gap between the end of Swanson’s watch at Gerston One and the beginning of supply from Gerston Two was more than a decade, and it is possible that the market for the original Gerston had simply been supplanted by other whiskies.